Entrepreneurship at the Bottom of the Pyramid seeks to demonstrate to students the range of entrepreneurial activities that can be implemented in developing countries to alleviate poverty. The book blends theory, visual examples and practical learning activities to help students apply their knowledge and encourage thinking ‘outside the box’. It begins by introducing the reader to two fundamental concepts - poverty and the bottom of the pyramid - so they have a solid grasp of the context in which the entrepreneurial activities are implemented. Next, the authors discuss the entrepreneurial process, highlighting the most relevant elements: risk, survival and growth, entrepreneurial actors, the informal sector and micro-credit. Finally, the book describes models to encourage entrepreneurial activities in developing countries. 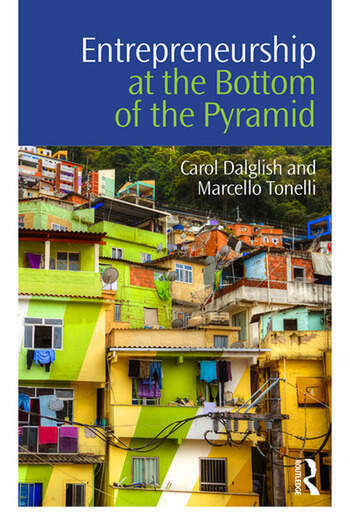 Weaving a primary case study throughout so the reader can apply new knowledge incrementally while moving through the chapters, Dalglish and Tonelli also include several shorter case studies, presenting different problems and implemented solutions in several geographical areas. Students with an interest in entrepreneurship, poverty alleviation and development studies will find this an important read. Carol Dalglish is an Associate Professor at Queensland University of Technology, Australia. Marcello Tonelli is a researcher at Queensland University of Technology, Australia.